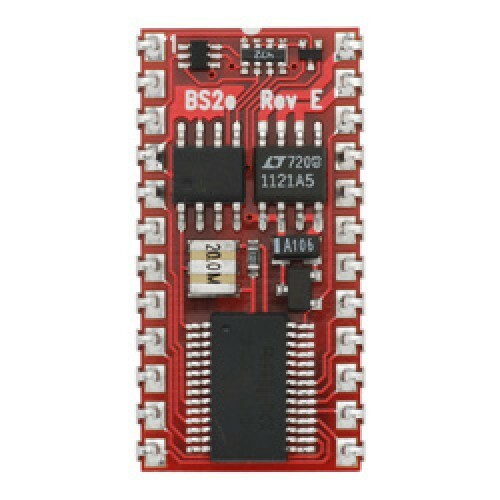 The BASIC Stamp 2e serves as the brains inside of electronics projects and applications that require a programmable microcontroller. It is able to control and monitor timers, keypads, motors, sensors, switches, relays, lights, and more. Programming is performed in an easy-to-learn language called PBASIC. All vital components (processor, clock source, memory, power regulator) are provided on the tiny PCB of the BS2e-IC; just connect power and go! Projects needing small, permanent soldering area for circuitry may benefit from combining the BS2e-IC with the BASIC Stamp 2 Carrier Board or the Super Carrier Board . The BS2e-IC is useful for those that have previous experience with the BS2 and would like more program space or the use of Scratch Pad RAM. For customers that require a more powerful or true multi-processing capabilities, we highly recommend the Propeller microcontroller. Program Execution Speed: ~4,000 PBASIC instructions/sec.